Posted below is the Shadow Foreign Secretary, Emily Thornberry’s letter to her constituents which paints a very different picture to that presented by former members of the shadow cabinet who took part in the staged walkout of the coup. The most significant aspect is her disgust at the way that the party hierarchy have done their best to stop Jeremy – first from getting on the ballot, then by excluding 130k new members from voting and then by the £25 ‘voting tax’ for supporters. It is so heartening to know that some MPs have a sense of what is democratic … and are prepared to stand up for what is morally ‘right’ not what is (apparently) politically expedient. ‘I do not understand why anyone in the Labour party would want to turn their back on that membership, in the way that the party hierarchy have tried to do this summer. Instead, it is time to unite as a party – the membership and the elected representatives alike – and together take our fight into the only contest that matters: getting this dreadful Tory government out of office, and punishing them for the mess into which they have plunged our country. What had begun as the necessary modernisation of the Labour party in 1994, showing how a belief in a dynamic market economy could be combined with the drive for social justice and the transformation of public services, had become distorted into an agenda where the test of every new policy from the leadership was how much it would antagonise the Labour party’s core membership. Tuition fees, the attempt to marketise the NHS, the careless disregard of long cherished civil liberties and the drive to war in Iraq were being imposed by a leadership who convinced themselves that, if the members hated it, they were doing something right. When I walked through the voting lobbies against the attempt to impose 90 days’ detention without charge in 2005, Tom Watson –then one of Tony Blair’s whips – growled at me that I was a ‘traitor’. But a traitor to who? Not to the country, when this was a draconian measure designed to look tough on terrorism, but one that would undermine the cohesion of communities like ours, alienate people and actually undermine our security. My members knew this and I remember when Compass polled party members – at my instigation – it was clear this was the national view as well. So who exactly was I betraying? Just a party hierarchy and a party leadership who were trying to shore up their relationship with the right-wing press by ‘taking on’ their members, and trying to out-flank the Tories on security. When Jeremy stood for the leadership after the disaster of the 2015 election, the difference was palpable. Here finally was a candidate interested in listening to the party’s members, reflecting their views, and promising to represent them. As a result, hundreds of thousands more joined, including huge numbers who had left because of Iraq, tuition fees, and other issues. Here we are now, less than a year after Jeremy’s overwhelming victory, and the party hierarchy – through decisions of the National Executive Committee – is attempting to overturn that result, quash Jeremy’s mandate, and put the party’s members back in their box. And they are doing so in the most naked way. I was disgusted to see the attempts to try to stop Jeremy from getting on the ballot. And then, if that wasn’t bad enough, hundreds of thousands of fully paid-up Labour party members were excluded from taking part in the election, having been told the opposite when they joined. Third, your membership fees were spent on securing that decision through the courts. And then lastly, registered supporters, who had been told they could be involved in the Leadership election, were then told that they must increase their donation to £25 within two days to remain eligible for a vote. Indeed, you should probably know that even to put on the social events we have held for local members in the last two months – occasions that have been really important to welcome in our new members – we have been forced to seek permission for each event from the party hierarchy. In short, some people have done their level best to deny the party’s full membership a fair and equal vote in this contest, or even the chance to make their voices heard. Instead of welcoming the enthusiasm of our new members, instead of celebrating the strength of our mass membership, they have been behaving as if it is something to be afraid of. As someone who spent nearly 30 years as a grass roots activist before becoming your MP, I cannot accept this. But even more important, as someone who believes our party and our country are best served when our elected representatives and the party membership work together, I fundamentally disagree with this attempt to take us back to the years when our members were deliberately antagonised, alienated and ignored by the people who they helped to put in power. Islington South and Finsbury Labour Party has a proud reputation for being one of the great campaigning local parties and our election results in the past 11 years have shown what can be done when the membership and its elected representatives work together with respect. We now have the potential to replicate this success across the country, creating a national activist base that could be unlike anything else in modern British politics, taking our message into the street and onto the doorstep, and turning the activism of thousands into the support of millions. I do not understand why anyone in the Labour party would want to turn their back on that membership, in the way that the party hierarchy have tried to do this summer. That is what we should have spent our summer doing – uniting, facing outwards, taking on the Tories, and energising the public to our cause – and that is again why I regret so much the chaos and distraction that this attempted coup against Jeremy has caused. So my plea to all members, and one I will make to my fellow MPs, is this: whatever the outcome of this leadership election, we should stop the internal division, unite as a party, and take the fight to the Tories together. And I would like my local party to know that I will remain totally loyal to the leader of our party, whoever he shall be. In the meantime, you all know that I have a very full in-tray with constituency business, and with representing the party on Brexit, foreign affairs, and – together with Clive Lewis – our future defence policies. I will be concentrating on this vital work in the run up to 24 September, rather than this unnecessary and divisive leadership contest. And when that is over, I hope we can all start focusing on those bigger issues on which Britain needs an effective, united opposition. I know that not everyone will agree with the conclusions I have reached, but I am completely confident that in Islington South and Finsbury, we will continue to debate this and other issues in an atmosphere of mutual trust and respect. Best wishes, and please as ever, let me know your views. Looking forward to seeing you on a doorstep with me soon! Obviously the answer depends entirely on what are George Osborne’s actual intentions? We are led to believe by government and commentators in the mainstream media that George is trying to ‘re-balance’ the economy, eliminate the deficit by 2017 (sorry 2018!) and create the conditions for the private sector to grow and export the UK out of recession/depression. He and David Cameron tell us that fiscal austerity or expansionary fiscal contraction, is showing signs of working and anyway, there is no alternative (TINA). More than halfway through the UK coalition’s term of office, the British economy is becalmed. Output is flat and confidence is perilously weak. The UK is experiencing its slowest recovery since the 19th century. Nearly half a decade has passed since the crisis erupted and the economy remains no bigger than it was in 2006 – more than 3 per cent below its 2008 peak. It is no longer fanciful to talk about a lost decade. I could find dozens of quotes in the same vein. So in terms of mending the UK economy, George Osborne has signally failed! However, this aspect of George Osborne’s strategy is, in his own terms, a success .. a real success. However, it has to be said that not everybody accepts George Osborne’s stated agenda as being his real purpose. I do wonder if part of the issue you and many other commentators have with Osborne and co is that you/we are ascribing to them a primary economic policy aim which is in fact not their primary aim. We assume that Osborne and co’s primary concern (aim) is to get the economy growing again. And to be fair, this is the impression that Osborne and co promote. But what if their primary aim is in fact to (try to) fundamentally restructure economic (and social) relations in this country (and beyond if they can) and that their belief is that to do that “austerity” is an essential tool. It can be argued that this is similar to the approach Thatcher employed between 1979-83. For example, under the cover of “austerity” we are witnessing a massive fire sale of public assets, planning laws are being relaxed, the NHS is being “restructured”, and so on and on, all to the considerable benefit not to the “big society” but to big business and big finance. After the initial panic surrounding the global financial crisis of 2007-2008 subsided, an opportunistic brand of neoliberalism emerged, that continued neoliberalism’s attack on government as a stabilizing, moderating force in society. This re-energized brand of neoliberalism advocates fiscal austerity and balanced government budgets, “worrying” that public bond issues floated during the economic stabilization process were “unsustainable” debts…. So is George Osborne failing or is he succeeding brilliantly? And does he know which agenda he is following? Does he actually believe in the failed neoclassical nostrums? Is he being ‘manipulated’ in some way by those vested interests who stand to benefit? Or was it always his intention to keep the crisis going to provide the ‘shock doctrine’ which justifies asset-stripping and re-structuring the economic/social relations of the UK ? 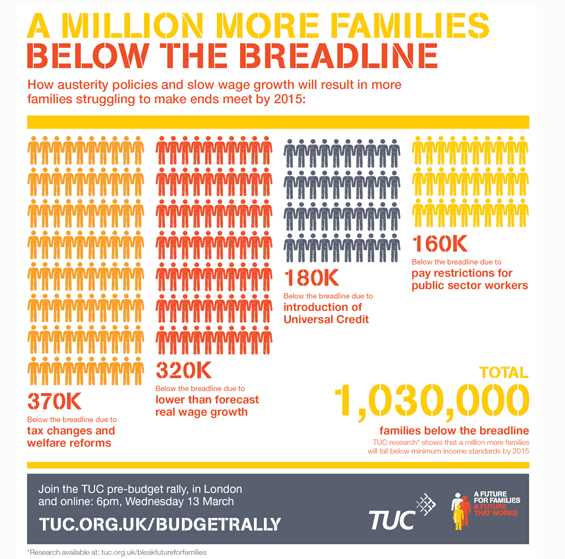 I’ll more than second that… but in the meantime, there’s another Osborne budget…. Soylent Green, George Osborne and Plutonomy. In this post I want to take a different tack and look at Labour’s ‘deficit problem’ from the other side. How can it get past the argument that deficit reduction is priority number 1? To me Labour’s problem is not how it explains how it will get the deficit down, rather the issue is that the whole argument about debt and deficits is economically illiterate. It misleads the public and completely hobbles any attempt by the left to take the initiative in the economic debate. So what is the deficit argument? Why is it so important to get the deficit down that as a consequence we have to suffer persistent high unemployment, increasing poverty and stagnant living standards? So to those who ask, incredulously, what we – the Liberal Democrats – are doing cutting public spending, I simply say this: Who suffers most when governments go bust? When they can no longer pay salaries, benefits and pensions? Not the bankers and the hedge fund managers, that’s for sure. No, it would be the poor, the old, the infirm; those with the least to fall back on. So but for austerity, Britain could go bust. Really? Where does this idea come? The argument goes that when we run a deficit, we must borrow from ‘the markets’. If the deficit gets too high the markets will start to worry we might not be able to pay back what we borrowed and so will start asking a higher rate of interest. If we keep borrowing, eventually the markets will say “no more”. Nick Clegg believes at this point, we could literally run out of money – we would be bankrupt. …this is plain wrong. In countries with their own central banks, governments cannot go bust because the central bank can simply print money to buy government debt: this is what QE is. Of course, this might or might not be a bad idea. But Clegg didn’t argue this. He just made a prat of himself. So we need to get past this nonsense (and it really is nonsense) that if we don’t ‘deal with our deficits’, financial armageddon awaits. But what about the Eurozone? Aren’t they on the brink of bankruptcy? Couldn’t that happen here too? The countries of the Eurozone took the decision to give up their own currencies and replace it with a common currency, the Euro. I n doing so they gave up the ability to issue their own money, to set interest rates and to manipulate their exchange rates. This means that Government spending really is constrained by how much they can raise in taxes or borrow from the markets. They can run out of money because they gave up their ability to create currency. This has lead to the markets periodically raising interest rates on Eurozone country’s debt to the point where in Greece, they actually were unable to borrow any more money on the markets and they had to accept their first (of many) bailout. This was the backdrop to the 2010 election here when we had Nick Clegg and George Osborne running around saying we were days away from becoming the next Greece. This was a fiction though. As long as the UK keeps the pound, it cannot run out of money. Nick Clegg’s idea that we can (or even already have), while idiotic, somehow still frames the economic debate in this country. Every suggestion of a new spending plan has to be ‘paid for’ by a corresponding tax rise or pay cut elsewhere for it to be seen as ‘credible’. NO IT DOES NOT! Until we get away from this spurious framing, we will never have a country we can be proud of. If Labour really want to work in the interests of working people (and to me, the jury’s still out on that one), the whole framing of the economic issues needs to be moved away from deficit reduction, and onto what we want our society to look like. To me, this is Labour’s deficit problem. It is the burden of unemployment and the decline in the national income which are upsetting the Budget. Look after the unemployment, and the Budget will look after itself.